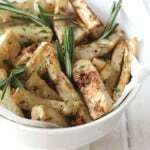 Peel and cut the celeriac in wedges or fries. Fill a pan with cold water and add the celeriac. Bring to the boil, drain the fries and allow them to steam dry. Add the oregano, garlic, salt and pepper and mix well. Heat the oil on a baking tray in the oven. When the oil is hot, remove from the oven and add the fries to the tray. Top with the rosemary stalks and return the tray to the oven for 35-40 minutes.